Blog / Where are solar panels best placed on my roof? Solar panel technology has come a long way in recent years, as the cost for solar has decreased more than 70 percent since 2010, according to data from the Solar Energy Industries Association. However, despite the cheaper cost, one thing remains constant — solar panels work best when placed on the side of your home that gets the most daylight. More daylight hours means more time for electricity generation and better value for you. Anywhere in the U.S., the place that gets the most sunlight is the south side of your home. So as you consider whether solar would be a worthy investment for your home, think about where the south side of your home is. Would you be happy with solar panels in that location? So if your home faces north, that means the back side of your home would be the optimal place for panels. If your home faces south, that means the front side of your home would be the optimal place for solar. 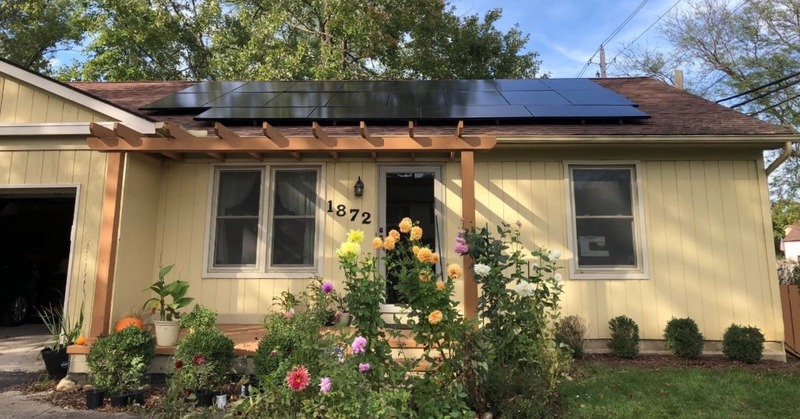 There are some who would rather not put solar panels on the front façade of their property (count some homeowners associations among those), but there are others who don’t mind at all, as the picture above would attest. That’s a decision you must consider when meeting with us. If HOAs are a concern, don’t worry, we verify any restrictions with your HOA and do not move forward with your project without their approval. If you’re one of those people who don’t want solar on the front side of your home, installing solar in your backyard on a ground-mounted array is an option too, provided you have the space to do that. Even if a ground-mounted array is placed on the north side of your property, we would align your panels to the south to get the full benefit. The end of a calendar year is a great time to envision what could be in your future. So do the little bit of homework to determine where south is on your property, and you will be able to forecast whether solar can be in your future from both a production and an aesthetic standpoint. And remember, the 30 percent federal tax credit will end in December 2019, so the time to act is now! With POWERHOME Solar’s innovative solar program, homeowners can go solar for $0 up-front cost, save money on their electric bills, and generate their own clean energy. The solar panels installed on your home are American-made and come with a 30-year warranty, with many panels expected to last well beyond that.